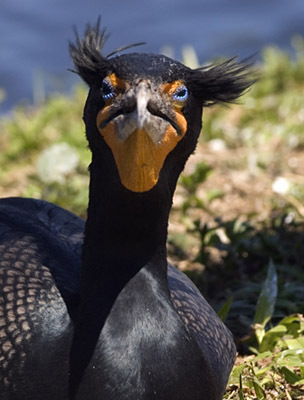 Grab Shot 26 - "Tacky Sunglasses"
"This cormorant was photographed in Everglades National Park a couple of weeks ago," said Frank Blanco. "I used a 100-300 zoom to blur out the background. The bird was resting on the side of a 'tourist' trial enjoying the South Florida sun and was not phased by the people passing by only inches away. The cormorant reminds me of an elderly, retired lady living on South Beach... you know the one I mean... who always wears those tacky sunglasses." Frank used a Nikon D100 set to 1/80th of a second at f-9 (Aperture Priority mode), ISO 200. I just wondered if anyone else noticed that the "Tacky Sunglasses" shot which was very cool had an error. It listed 1/80th second at f9 at 200asa. In direct sun, it would have been 1/800th second. That extra zero was left out.